I got my photos from the photographer at the weekend and I am really pleased with them. He has captured the texture and sparkle in my work, which I struggled to photograph myself. My website is really beginning to take shape (thank you Michael), and now that I have the photos, we can get on with the gallery page. In my last post I mentioned my festival character, Nana Knitwit. Now I have photos of her I can get on with creating her page on the website. In the meantime (and because I have done no work whatsoever on my white velvet designs) I thought I would tell you a little bit about her origins. In July 2010, some of my work was exhibited at Eccles Community Art Gallery. While I was setting up, the manager of the shopping centre came in to talk to Karen (the founder of the gallery), asking if she knew any artists who might be interested in doing an activity in one of the empty shops during the Eccles Festival. I volunteered to run a Knit and Natter. Straightforward, I thought to myself. The weekend before the festival I spoke to Karen again, and in passing she just happened to ask if I was going dressed as a zombie. I have to be honest; this is not a question I get asked often, so I was taken a little by surprise! Apparently, during the festival, the shopping precinct was to be the venue for the Zombie Games, a film and multi-media project run by Let’s Go Global. Youngsters from all over Salford were participating and professional makeup artists would be available to make us up. I thought about it for a while and decided that with an emergency supply of anti-histamines (I react badly to some make up) I would join in the fun. I created the persona of an artist who had been zombiefied in the late 1970s / early 1980s. The makeup took ages but was great. I sat in the shop window with my giant knitting needles as a kind of installation, until people joined the Knit and Natter. Have a look at the photos on Facebook and the film on You Tube. I make a brief appearance early on. I had plenty of visitors including Gail, a contact from Ordsall Community Arts, who I knew from a while back. She was also disguised as a Zombie so we didn’t recognise each other at first. 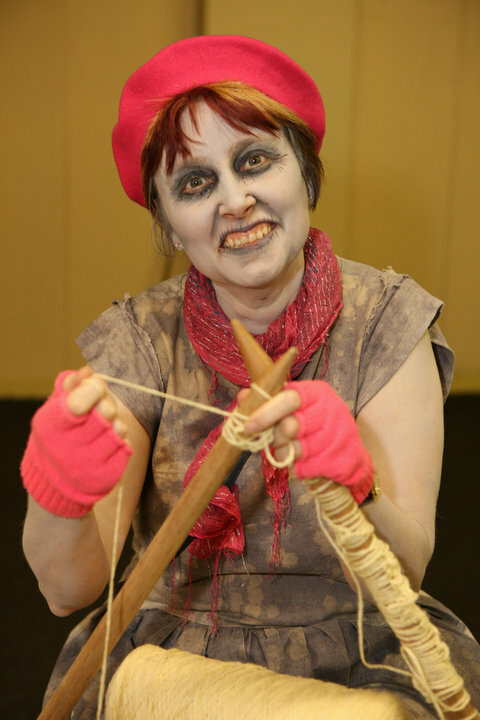 Gail had two young people with her who enjoyed the knitting so much they asked if “Nana Zombie” could come to their local festival the following week. 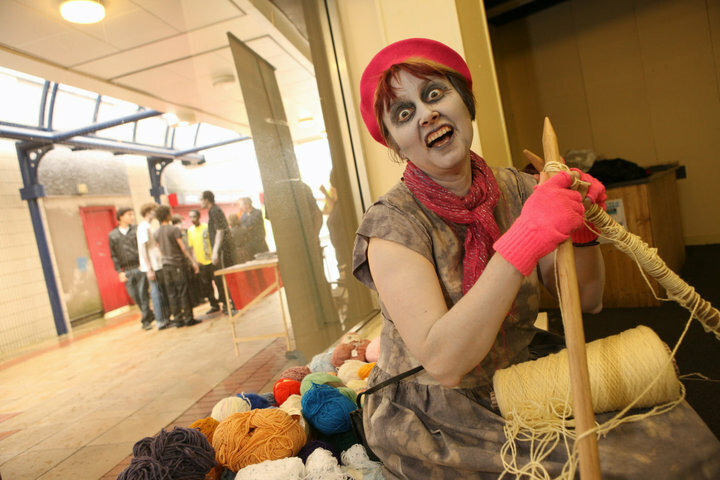 As Nana Zombie would not really fit in at a festival where there were no other zombies, Nana Knitwit was born. Fabulous photos! I can’t imagine anyone nicer to teach knitting – or have a nice cup of tea with, come to think of it!